When space and budget is your priority, this Epic 7.2 cu.ft. White Refrigerator delivers unmatched value. Features include 3 tempered glass adjustable shelves, separate freezer section with removable shelf, Automatic Defrost Refrigerator to keep food fresh, adjustable full width door storage and full size vegetable crisper with glass cover. Perfect for the cottage, chalet, basement apartment, in-law suite or office. Energy efficiency meets Timeless style, this Epic 7.5 cu.ft. Retro Style Auto Defrost Refrigerator (Manual Defrost Freezer) is perfect for apartment sized homes, the cottage, office lunchroom or as a second refrigerator! Stunning black finish with chrome trim and handle will match any decor and is a great conversation piece when entertaining! Two tempered glass adjustable shelves , 5 bottle chrome wine rack and adjustable door storage. 22"W x 57"H, RH Hinge only. 20 cu. ft. Top Freezer Refrigerator with Premium LED Lighting in Stainless Steel - ENERGY STAR® This large capacity top-mount refrigerator with 20 cu. ft. of space at 30-inches wide has a lot to offer. The sophisticated styling transforms this traditional style refrigerator into a leader in its category. Meanwhile, the electronic temperature control system helps keep your food fresh by keeping temperature and humidity levels where they need to be. This fridge supports a built-in ice maker, sold separately. 20 cu. 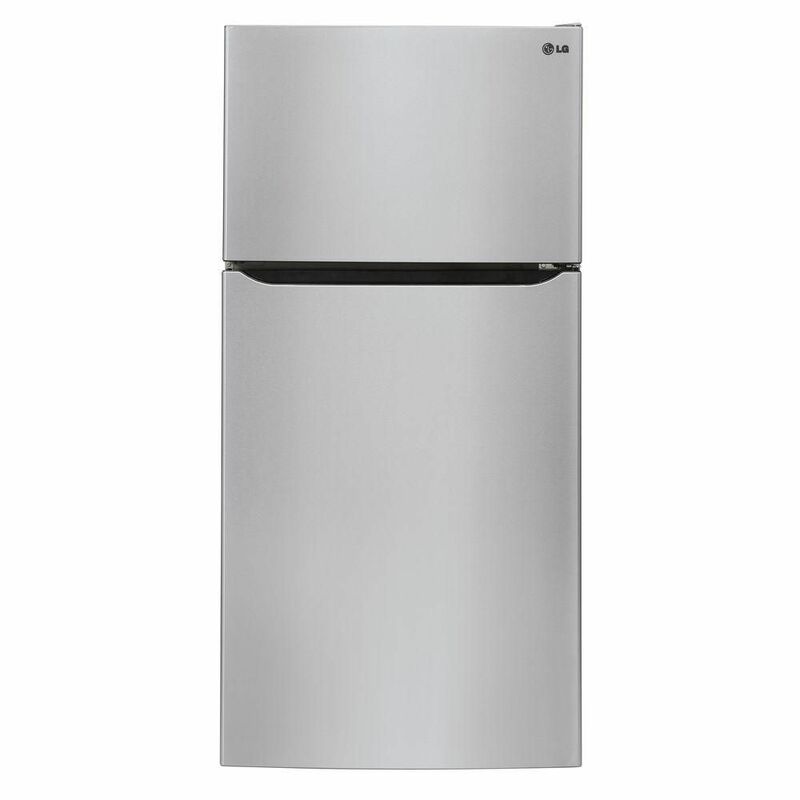 ft. Top Freezer Refrigerator with Premium LED Lighting in Stainless Steel - ENERGY STAR® is rated 3.4 out of 5 by 5. Rated 4 out of 5 by Puma from Temperature even throughout I received this fridge a few days ago. It keeps the temperature pretty even throughout. I wish it had a deli drawer which my only real grips with it. Rated 1 out of 5 by MacKenzie from Died after 2 weeks. We had this delivered on Dec 11th 2018 and came home on Christmas day, to find the fridge alarm going off.... no lights, no compressor, nothing. It was full of Christmas food, we had to put as much as we could in a cooler and put it on the deck. After speaking to LG customer service, we were told to call a local repairman..on Christmas day, yeah right. We are still without a fridge, no help from Home Depot, waiting to see if it can be fixed tomorrow. Unbelievable, a two week old fridge, and we have to have it repaired?! Extremely unhappy with all the involved parties. It should be exchanged, I have a good mind to drop it off at customer service..less than 30 days, surely it can be returned?! I am posting this, in the hopes that someone at LG can intervene......?.We were told that LG has the best customer service...lets find out. Rated 5 out of 5 by Gary from Positive experience and this is why... The local Home Depot had a sale and we purchased this unit for 25% off the retail price. They even included delivery. The Home Depot salesman was very friendly and super helpful. I think he is positioning himself for a management position.lol. LG sent us an up graded model that is able to be control wireless via our cell phones. I called them and they said that, the model we had chosen would have meant a day or two delay on the delivery so they decided to up grade to the next model instead. The Logistic company is bilingual and delivered on day we selected. They phoned us an hour before they arrived which worked out perfect because my spouse only works 20 minutes away. They brought the fridge in, did a detailed inspection for any damages because they would've taken it back even if there was the tiniest scratch on it and took away all the packaging. Very professional. The fridge runs great and the stainless steel is an improvement from our old white fridge. I think we did well for a brand new fridge that cost $708... plus taxes of course. Rated 2 out of 5 by Eric from Poor service from LG The fridge was delivered with a significantly crooked freezer door, obvious manufacturing defect since the door was still well taped (tape had not moved). I tried to align the door by lossening the inge bolts per intruction manual but it would not move. I called LG to get held from their service technicien, they told me that crooked door is not LG`s responsability (not part of their service policy) and that I was on my own with this. To fix the problem, I had to drill the inge location pin holes oversize, align and reinstall the door. Thus far, really not impressed with LG after sales service, considering this is a brand new product. Also, people at LG customer care were had language difficulties and did not seem competent. Can the doors be reversed on this Fridges. just says right hinge in the details. and does give option when you put in cart with warrenty and such. Hey Chelsie13! Thanks for your interest in our product! Yes, you can definitely reverse the door on this fridge! The owner's manual will have a section instructing how to do it! Best regards!